In a partial exploration of decaying childhood jingles, I came across Neil Gaiman’s hyperreal book The Ocean at the end of the lane that superbly combines fear, fairytales and fantasy. The determined child in his book Coraline too left a memorable imprint, some years back. Despite her horrific adventure with the black button eyes her story touched me; I was taken aback by her unattended grief. Looking down memory lane, one of my own childhood mischiefs would comprise of seeking out for more questions about tales with a single ending. Folktale figures persistently portrayed as cruel “rakhossi” or “dayini” etc, I felt, made an innocent’s perception of reality much unfinished. Be it limericks, or songs or lullabies or rhyming nonsensical stanzas, I would bully my grandparents to complete bedtime jingles. Today’s kids however, spend much of their time listening to gender-biased obnoxious refrains picked up from T.V or the internet. They are mostly clueless about the once rolling childhood gateways unaffected by the adult world. Aptly put by one of my favourite contemporary writers Chimamanda Adichie in a 2009 talk, children are the most vulnerable in the telling and re-telling of a ‘single story’ that makes it the ‘only story’. I am terrified that something similar may be happening with the fall of diverse childhood jingles from the lips of tiny tots. 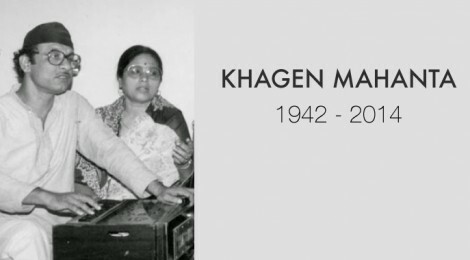 With the death of Khagen Mahanta, father of the popular contemporary singer Papon (aka Angaraag Mahanta) Assam has recently lost a reverent figure of music and folklore. I remember his voice coupled with the lyrical simplicity of Late Keshav Mahanta, the true poet of the masses and winner of Sahitya Academi for his 1993 collection-Mor Je Kiman Hepah. Thatmusical intellect runs in this family is a fact well-known today, myriad compositions have enriched the repository of Assam’s folklore and literature. Known as “Bihu Samrat” for songs like “Bihu maariboloi Manomoti Hera baai” “Bohaagor kuhipaat”etc, he also sang most of our beautiful childhood jingles. Lyrics that dwell in greenery, the fragrance of soil and flavour of folklore, they touched the very chord of memory that is still afresh. “Mon mur pothar halodhiya” poignantly links the aerial universe to the lives of farmers who are attached to the rice fields. Then, there is very fond melody among friends who grew up with me, called “Maa ami xodiyaloi jaamei”. This song associates childhood desires of exploring the splendour of Xadiya (The birthplace of singer Bhupen Hazarika). As Xadiya is located at the Assam-Arunachal border (on a grassy plain, surrounded by Himalayan mountains), little children were told by elders that it is full of the supernatural. The lyrics clearly subverted this notion and very soon became a jingle kids danced to in primary school. Such fertile lyrical imagination is also to be found in Bangla jingles and lullabies. Adapted from folktales and routine struggles, the gradual demise of songs like “Dol Dol Duloni” “Shona ghumalo pada juralo” “momo chitte nite nitte”, has left my friend Silpa Mukherjee perturbed as well. She stressed upon the fact that there is a need to go back and resurrect regional literatures for the market is depriving children of some of the unadulterated joys of life. The universe of “Borukhunor botorat moina nuthe motorat” sang by Khagen Mahanta depicted the beauty of rootedness in a way that people from all ages could connect with it. This paved the way for an entire generation of Assam in awe of this artist and a generation of children in love with regional folk literatures. In a world where all market products are readily ‘consumed’ by kids, it wouldn’t come as a surprise that they not only know there is no room for imagination in the real world but also no credit is bestowed upon the ‘imaginary ideal’. In contrast to this, childhood jingles of the past were sprinkled with metaphorical ornamentations and riddles, often leading you to a larger ‘reality’, a historical message. Had jingles and “kabigaan” survived, we would have saved an immense source of entertainment, pleasure and wisdom from decay. Added, we would have been able to derive the stories of weavers and treasure them. Khagen Mahanta singing to “Aai O xiponi” reminds me exactly this. A song delving in the imagination of weavers binds their desires and hopes together. On a figurative note, the struggles of rural weavers who weave cloth for their livelihood are brought to limelight. Songs like this that follow a conversational style, encourages a child to question, leaving equal room for “Doubt” and “belief”, something that is missing blatantly in the kind of music or toys that kids find exciting. Soon, the alternative voices from storytellers and poets entered the world of childhood jingles. Children were not dependent on the saccharine, monotheistic narrative of the fairy tale. The characters in these stories were no longer puppets, doomed to live out a single trajectory over and over again. Say for instance, Agha Shahid Ali’s 1987 poems “The wolf’s postscript to Little Red Riding hood” and “An interview with Red Riding Hood, now no longer little” dig deeper into subaltern issues- from red riding hood talking as an adult to a challenging of the “Big Bad Wolf”. It occurs to me that we may not have played with a toy resembling Red Riding Hood, but we knew sooner or later that the wolf is allegorical and fright comes to us in innumerable forms. This upbringing was also a result of the to and fro mobility between the “real” and the “unreal” world. But with the bed-time and school -going jingles falling from the charm of childhood’s lap, these margins have collapsed, very cynically so. This collapse has ended every bit of fantasy that led to happiness of an ephemeral nature, something that was free and unadulterated. So if kids lack the enthusiasm for attempting to change our currently frightening world, it is not because they are a totally phlegmatic lot. But perhaps, we the adults have lost the energy and skill to sing to them stories, rhymes and jingles that convince them an alternative, egalitarian and peaceful universe is indeed possible. Rini Barman has completed her Masters in English Literature from Jamia Milia Islamia. Her writings have been previously published in Muse India, The Northeast Review, The Seven Sisters' Post, Kritya.in, The Bricolage-An independent Arts and culture magazine, The Thumbprint News Magazine, Newsyaps, the Eclectic and several other dailies of the North-East.